Instantly deals 374 Beast damage and has a 20% chance to Poison the target for 98 additional Elemental damage per round for 1 round. Best looking skin of the scorpid battle pets by far. With the exception of the scorpling, the rest look silly. Love this little guy. Using an HP breed, but considering another for PP. It is already plenty defensive. With blinding poison and extraplating, the cooldowns line up to blind the enemy on the vunerable turn before refreshing your plating. And then you can windup freely! I believe this to be better than its pure offensive options. Other pets do the poison thing better. 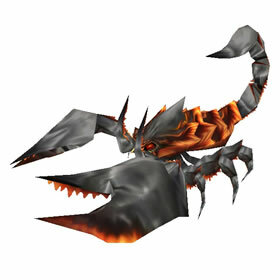 This pet is most likely a reference to the quest "Frankly, It Makes No Sense..." from The Burning Crusade, in which you pilot a mechanical scorpid into some lava. Considering that we're on Draenor again, I guess Blizzard felt it was finally time to bring them back. Anyone else think they missed a trick with this one by not making it look like a miniature Iron Juggernaut? That model looks great and is clearly mechanical, unlike this one which just looks like a regular Azeroth scorpion. I built one today with S/S was super happy as it was my first one. Wow...This may be the new Death Adder Hatchling. Well, maybe not, being there is no S/S 341 breed, but take a closer look at the abilities. On top of Barbed Stinger, providing a great DoT (albeit only 20% of the time), you may apply a Black Claw. That equals over 200 per turn once applied. If it doesn't pop up from Barbed Stinger, then Blinding Poison does it. Extend your life with the Mehanical passive or Extra Plating. I'm only concerned about the speed (260) with the P/P breed. Just made one today. Anyone else wish [Puncture Wound] and [Extra Plating] would switch places? Iron, iron, steel and fire. Bellows, gears, plates, and wire.